Some reactions children may experience with food allergies are hives, rash, itchiness and difficulty swallowing and breathing. While some reactions are relatively mild, they can become life-threatening in an instant. Medical ID bracelets will alert medics and caregivers as to a child’s allergies and allow for faster treatment. Medical alert bracelets for kids can help identify your child’s food allergies for others in an emergency situation. Peanuts: Peanuts can be found in candies, cakes and many processed food items. Symptoms may be hives, itching, breathing difficulty and nausea. Tree Nuts: Tree nuts include almonds, cashews, chestnuts, macadamia nuts, pecans, pistachios, walnuts and more. People allergic to one tree nut are advised to avoid all nuts. They are also advised to avoid peanuts because of a high likelihood of cross-contact with tree nuts. Milk: Milk is found in yogurt, sauces, ice cream, candies and cheeses. Symptoms of a milk allergy may be diarrhea, constipation, hives, vomiting and wheezing. Eggs: Egg can be found in breads, pastas, sauces, cakes and candies. Symptoms of an egg allergy may include hives, itchiness, abdominal pain, and coughing. Wheat: Wheat can be found in breads, cereals, pastas and snack foods. Hives, nausea, vomiting and difficulty breathing are common signs of a wheat allergy. Soy: Soy is found in legumes, sauces and foods that contain soybean oil. Symptoms may include hay fever, acne, breathing difficulty and itching. Fish: There are more than 20,000 species of fish, with commonly reported reactions to anchovies, bass, catfish, salmon, tilapia and more. Some unexpected sources of fish are Caesar salad dressing, Worcestershire sauce, bouillabaisse, meatloaf, and barbecue sauce. Shellfish: Shellfish allergies are different than fish allergies, so people can have either or both. Shellfish includes crab, lobster, shrimp, and prawns. Although not labeled as such on products, mollusks, clams, scallops, oysters, squid and octopus may be advised against by your doctor as well. 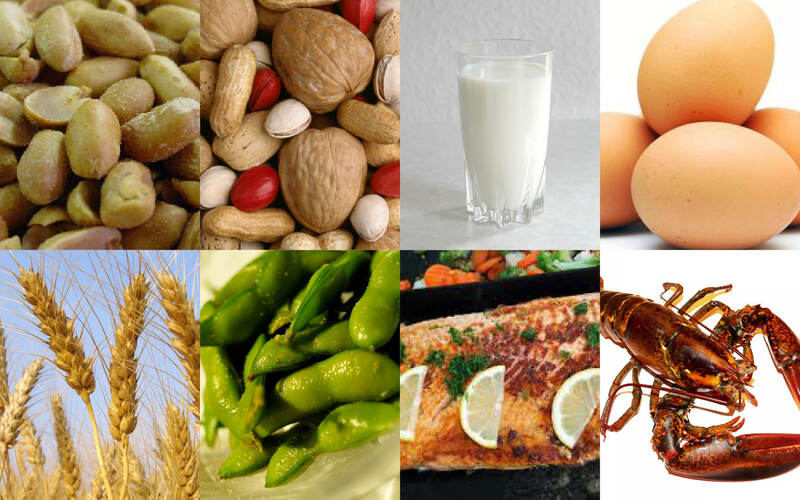 If any of the above items are ingested by an allergic child, reactions may begin immediately. Breathing, speaking and swallowing become nearly impossible. Calling 9-1-1 may be required in order to obtain life-saving help. Once paramedics arrive, they have a better chance of saving a child if they know what is causing the reaction. Medical ID bracelets become essential when a child is away from home at daycare, school or at a sleepover, intensifying the need for someone other than the parent to notify paramedics during a situation mandating a medical alert. alert bracelets for kids, food allergies. Bookmark.